Quarter and core the pears then cut into large dice. Cut the blue cheese into small pieces and mix with the salad. Roughly chop the walnuts. Wash and dry the radicchio and red leaf lettuces. Gently tear into large pieces and place in a serving bowl. Melt the butter in a large frying pan over medium heat, add diced pear, and sauté for approx. 3 – 5 min. Add the sugar and let it caramelize before adding the walnuts. Stir well to coat the pears and walnuts in the caramelized liquid. Remove the pan from the heat and set aside to cool a little. To make the dressing, squeeze out the lemon juice and add to a jar along with the mustard, honey, olive oil, and poppy seeds. Season with salt and pepper. Place a lid on the jar and shake vigorously to combine. 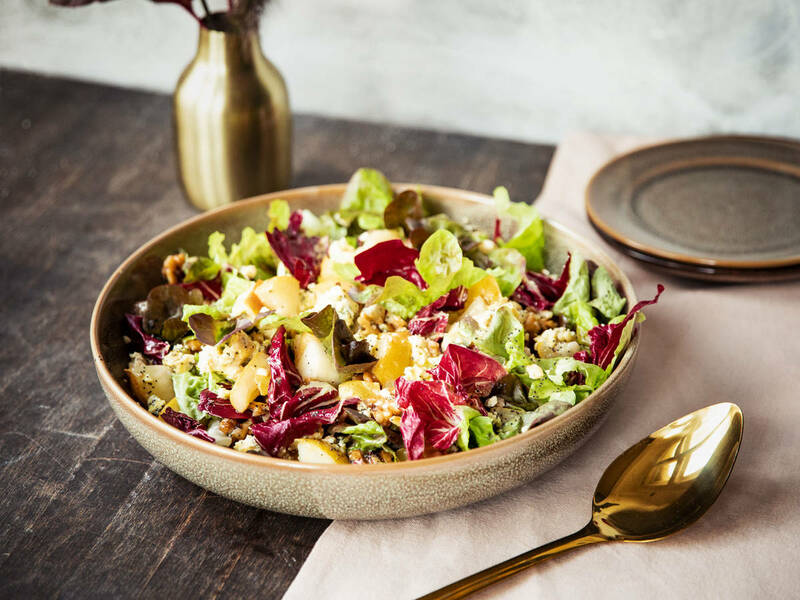 Place the cooled caramelized pear and walnuts and the blue cheese on top the salad leaves, pour the dressing over the salad and toss gently. Enjoy!